Reader Brian Lee contributed this report on Aug. 1: Glad that you posted an update on Truax Island (June 14, 2013). I went there this afternoon since I’d never explored the park, though I’d driven by several times. Right away, I noticed the ‘Truax Island’ sign was missing below the Willamette Greenway sign for the northbound traffic on Riverside Dr. I also noticed the Stop sign that was for traffic coming out of the park was missing. I suspect the Stop sign was removed when the neighbor’s new wood fence was put up, right next to where the metal post had been. There seems to have been a couple other gates in the past besides the present one across the entrance drive. 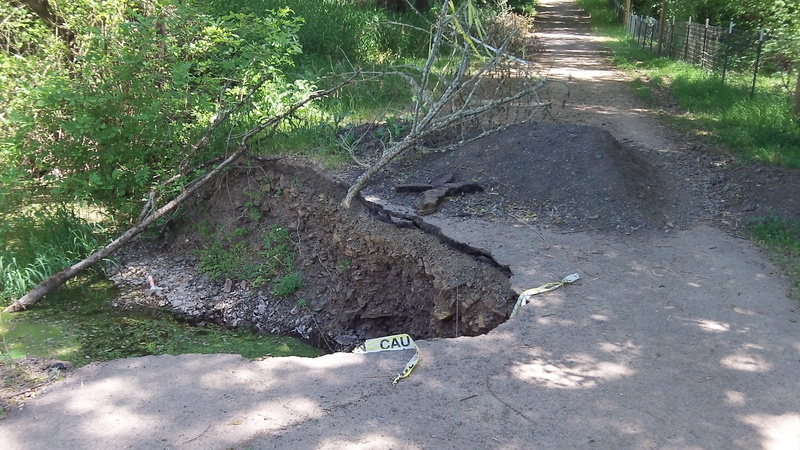 The “washed out” section appear to be due to the corrosion and collapse of one of the large pipes going under the road, followed by erosion around it. 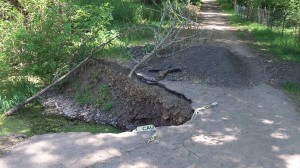 A little more has fallen in since your photo and only scraps of the Caution tape remain around the missing roadway. The remaining part seems sturdy but people of substantial weight should not stand near the edge. As I crossed this causeway, great herons were hanging out on objects in the water. They were skittish and flew off when I came into the “island” and again when I left.. Someone has done some very recent trail maintenance (brush trimming) on a couple trails. I also found little memorials in various spots around the park– buttons, colored paperclips, writing in dirt, sticks and rocks arranged in a certain fashion, a partial jar of peanut butter, and little bags of SweeTarts. I would guess they were made by middle school – late elementary school kids. One was right near the end of the trail before it plummets off into the Willamette R. That certainly would not a good put-in place and the water flow right next to that shore looked tricky. Truax seems like it would be a good place to bird and bee watch. Also to pick wild blackberries.